The Rivr Monthly Programmatic Industry Must-Reads. Our monthly post includes a recap of the latest programmatic industry news. One of our partners, a European-based SSP, was looking to increase its revenue performance while simultaneously decrease its operational costs. They were excited to see how Rivr’s audience authentication algorithms would enable floor pricing and demand selection on the user level. Download our case study to learn how Rivr increases revenue performance and decreases operating costs. Where should we send our case study? For the last year, Simplaex has been developing our Audience Yield Manager called Rivr. Thanks to the input of our beta partners, we’ve developed a fantastic platform that allows Publishers and SSPs to set the right floor price and select the relevant demand partners — on the audience level. Now it’s time to hit the road and share Rivr with the rest of the world! In order to do that, I’m about to embark on a tour across Europe and North America, making stops in various conferences and sundry cities. This doesn’t take into account a number of smaller trips to Paris, Hamburg, San Francisco, Tel Aviv and London! Berlin is nicely bookending this tour. We’ll be starting off easy with Mobile Growth Summit in Berlin as the first stop. The last event will be Simplaex’s own event at the start of December back in Berlin! A nice way of celebrating the finish of the tour with an event in our own backyard. For now, I’m going to rest up, stretch (never want to pull a hammy!) and prepare for the adventure. First Stop — MGS Berlin! Follow my progress on twitter @bjhansz or via the Simplaex Blog. Rivr — billed as a universal translator for the programmatic ecosystem — is trying to refine the transaction process. Can a small startup achieve the ambitious goal of simplifying a crowded marketplace? In my short time covering the martech space, one thing has quickly become clear: Marketing exists in theory and in practice. The gold standard for marketers is for their customers not even to notice they’re being marketed to — to deliver the exact right thing to the exact right person at the exact right time. Yet, with technological innovation comes technological difficulty, and noble as the programmatic advertising space is in its quest to maximize efficiency, there are more than a few efficiency gaps. Enter: A small Berlin-based startup, Simplaex, that made a big announcement in June at AdMonsters 2018 Ops Conference in New York City. It announced the beta-launch of a project called Rivr — billed as a universal translator for the programmatic value chain to classify audiences and support SSPs and publishers to understand and anticipate any change in the bid stream on an audience level. “In our conversations with advertisers, publishers and SSPs, we heard a number of recurring themes, all related to the fragmentation of the programmatic supply chain. Rivr addresses these themes head on without adding another layer to the tech stack,” said Simplaex CEO Jeffry van Ede in June. I recently spoke with Benjamin Hansz, Simplaex’s VP of strategy, to discuss how the solution works, and what it might mean for the future of managing audiences in the programmatic marketplace. There are too many parties involved, and thus, wires get crossed, mistakes are made. Rivr, the AI-powered special project of Simplaex, which is still currently in beta testing with at least four different partners (whom Hansz declined to name) aims to eliminate the causes of that distrust. Currently, an advertiser sends out their request to a hundred different demand partners, and if you’re lucky, as Hansz says, perhaps three will reply. That’s a lot of wasted spend in finding those suitable three. But how? Hansz said the data Rivr needs to work is the same data already available to SSPs. Rivr is in the early stages, with an ambitious goal of expanding its partners and going commercial before the end of the year. There are multiple machine learning models for different datasets (age, gender, interests, engagement likelihood) that are all in automated communication with one another. Hansz said that its partners have seen five times higher clickthrough rates in beta testing, and the company is hoping that will carry them to commercial success in the coming months. If that’s true, it’s hard to imagine why it wouldn’t be welcome. Publisher alliances and why they haven’t delivered on their promise. Consolidation in the industry, especially on the supply side e.g. Snap & Metamarkets, Rubicon & NToggle. Blockchain being applied to digital advertising — a welcome degree of complexity that will add value or just hype. If the complexity of technology should be applied to those areas where humans cannot perform — like in how RTB works in less than 200ms. What does the landscape between Publisher and Advertiser look like in 5 years? If simplicity of technology should be used where humans need to interface with technology or rather at the intersection of manual and automation — like in set-up, execution, and reporting, among related topics and issues. To attend this special roundtable breakfast, please register here. 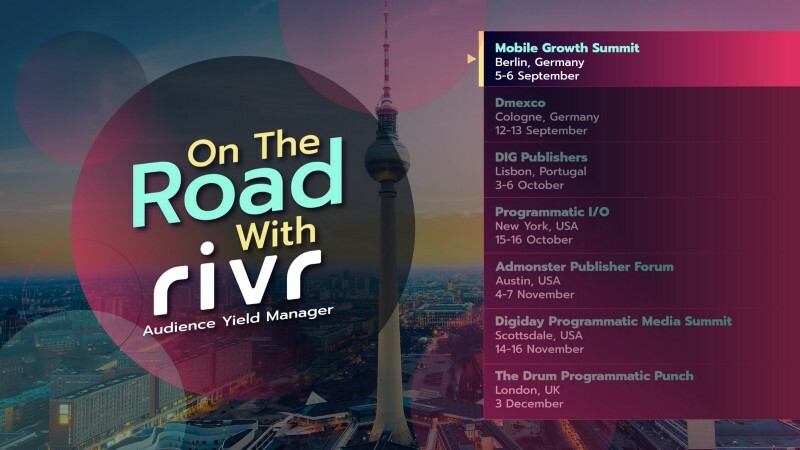 Rivr is a new Audience Yield Manager, powered by Simplaex’s AI-backbone, that enables SSPs and publishers to progress to an audience-based performance model, delivering exponential value to both advertisers and publishers. Rivr is the first AI technology that will reduce waste and complexity, create a new kind of transparency and control to deliver ROI benefits across the full programmatic spectrum. For more information, visit http://biz251.inmotionhosting.com/~rivrai5/ or follow us on Twitter.